Reagent exhibits at least 67% transfection efficiency of siRNA delivery. Transfection efficiency was determined by real-time RT-PCR. Triple-negative breast cancer is an uncommon subtype of breast cancer that lacks receptors for estrogen, progesterone, or HER2. It is an invasive type of cancer with limited treatment options. The 4T1 triple-negative cell line was established from the tumor of the mammary gland in a mouse (Mus musculus). This cell line was selected as resistant to 6-thioguanine without mutagen treatment. This type of tumor easily, and quickly spreads throughout the body of the mice it effects. This tumorigenic cell line exhibits epithelial cellular morphology. These cells are useful model in cancer research. The 4T1 cell line is especially valuable for stage IV human breast cancer studies since tumor from this cell line mimics human breast cancer and easily metastasizes through mice, making a suitable breast cancer model. The 4T1 murine breast cancer cell line is transplantable and has the ability to exhibit similar aggressive phenotype to the human breast cancer. Altogen Biosystems offers pre-optimized transfection kits for the 4T1 cell line. Figure 1. Cyclophilin B silencing efficiency was determined by qRT-PCR in the 4T1 cells transfected by Cyclophilin B siRNA or non-silencing siRNA control following the recommended transfection protocol. 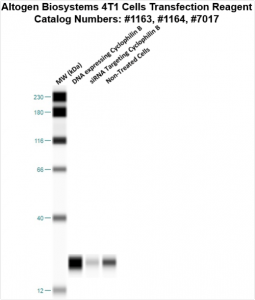 Cyclophilin mRNA expression levels were measured 48 hours post-transfection. 18S rRNA levels were used to normalize the Cyclophilin B data. Values are normalized to untreated sample. Data are presented as means ± SD (n=6). Figure 2. Protein expression of Cyclophilin B in 4T1 cells. DNA plasmid expressing Cyclophilin B or siRNA targeting Cyclophilin B were transfected into 4T1 cells following Altogen Biosystems transfection protocol. At 72 hours post-transfection the cells were analyzed by Western Blot for protein expression levels (normalized by total protein, 10 µg of total protein loaded per each well). Untreated cells used as a negative control. Altogen Biosystems is a life sciences company that offers cell type-specific and pre-optimized transfection products, elecroporation kits, and in vivo delivery reagents. Advanced formulation of reagents and optimized transfection protocols provide efficient intracellular delivery of protein, DNA, mRNA, shRNA and siRNA molecules. Read more about transfection technology at Altogen’s Transfection Resource.